Happy to see a woman on the very first cover! Real Producers is a brand originally started in Indianapolis. It is now in over 45 cities across the US—February marked the inaugural month for Fort Wayne Real Producers. We are honored to partner with this brand, and help shine the spotlight on local realtors in the area. The magazine is delivered to the top 300 realtors in the Northeast Indiana area every month. 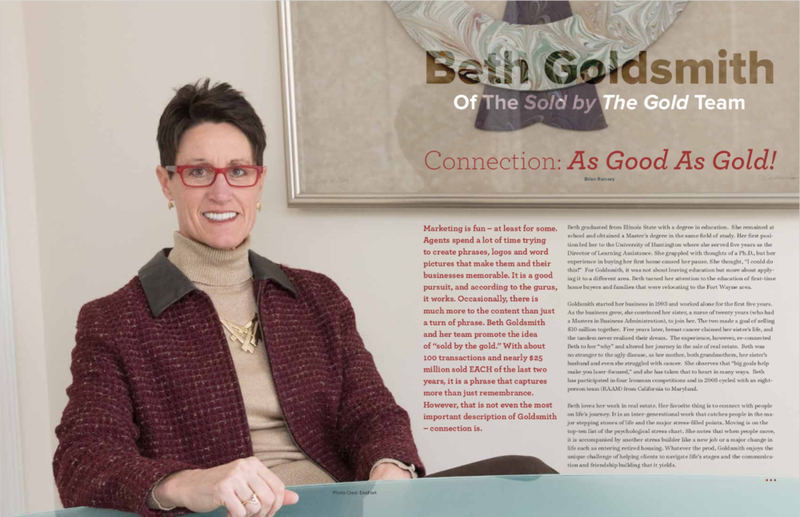 Beth Goldsmith, with North Eastern Group Realty graced the very first cover. As part of the Sold by The Gold team they have sold nearly $25 million in real estate for two years in a row. This is not even the most impressive aspect of Beth however—this year Beth celebrates ten years of being cancer-free and 25 years in business—with four Ironman competitions to boot. Every transaction by Beth's team brings a $100 donation to cancer research and care, and so far Goldsmith has raised over $115k. To say that she is an inspiration to many in an understatement. We are so happy to celebrate Beth for this very first Real Producers issue. Sam Hartman, of Coldwell Banker was also featured as the first "Rising Star" for Fort Wayne Real Producers. Want to know more about Real Producers Fort Wayne? We are pleased to bring you your first issue of Fort Wayne Real Producers. It is our mission to inform and inspire realtors all over the Greater Fort Wayne area. The publication has both a social side and a business side. It will highlight top producing agents and give you an inside look at their life as well as their business. N2 Publishing will be responsible for the layout of the magazine, as well as selling ad space to local businesses to cover the costs of printing and mailing. This publication is being provided FREE OF CHARGE to you as a top producer in real estate as the cost of producing, printing, and mailing each newsletter is covered by the advertising partners that you see in each issue. We do our best to screen our advertisers to ensure that they can provide the types of services that you may need or want as a realtor. If you currently utilize a business that does excellent work, please let us know as they may want to reach out to your associates as well. Also, if you own or run a business and would like information on reaching top realtors each month, contact me for advertising information. In each publication, everything you will see is unique to the Fort Wayne real estate market, and the publication will reflect who you are as a community of realtors. A typical publication will include: social event information specific to the area, upcoming meeting information, fun and free social events put on by Fort Wayne Real Producers, upcoming developments, top standings, business information, pictures, personal stories and articles, along with other information specifically tailored to the Northeast Indiana market. Along with the magazine, we will host various free events to bring the realtor community together. This would include social events - free food, drinks and door prize giveaways for everyone in attendance. These will be held out at top restaurants, unique local venues, model homes, and more. We will communicate to you the various events we are hosting through the newsletter and emails. If you wish to be included, please email me at jon.good@realproducers.com. The events and publication are designed to increase social connections between top realtors and top affiliates so that the best of the best can grow their business together. It is our goal that the events create a culture where there is no "hard selling" but a culture of relationship building on a more intimate level. I'd like to personally thank all our business sponsors who partnered with us making the magazine free to all our top producers, as well as the many realtors who contributed to the first issue. Just know that Real Producers Fort Wayne would not exist without you! I look forward to meeting each of you at our upcoming events!"